The color of light--even the color of daylight--can affect how you function. 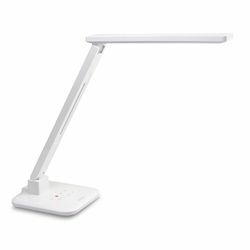 Satechi's LED desk lamp lets you select the spectrum you wish to work or read in... just touch a button to change the light's "mood." You can also control the brightness level and the fully adjustable arm puts light where you want it... not in your eyes. The highly efficient and toxic-free LEDs consume only 1/8th the power of an incandescent lamp and are rated for 40,000 hours. Includes AC adapter.